Failing to implement time clock rules for hourly employees as well as non-exempt salaried employees is not an option for employers. The federal Fair Labor Standards Act (FLSA) and numerous other state laws require employers to keep records of all non-exempt employees’ hours worked. The FLSA requires that time records show the date and time a worker’s workweek starts, the number of hours worked each day, and the total hours worked during the week. Salaried employees are entitled to receive their full amount of base pay if they work any hours during a work period. Hourly employees are only entitled to be paid for the hours that they actually worked. Many employers incorrectly believe that the important distinction for timekeeping purposes is between hourly and salaried employees. However, it is actually the distinction between exempt and non-exempt employees which is relevant for timekeeping purposes. Non-exempt employees are entitled to overtime pay and exempt employees are not. While all hourly employees are non-exempt, there are both exempt salaried employees and non-exempt salaried employees. Whether time spent on-call is compensable is a very fact-specific question. An on-call employee who is not required to remain on the employer’s premises, but is only required to notify the employer where he or she may be reached is not working while on call. This is true so long as the employee is free to engage in personal activities when he or she is on call. The on-call time isn’t even compensable if the employee has to carry a pager and report to work within a specific, reasonable time period. However, the employee is entitled to on-call pay when the on-call conditions are so restrictive or the calls so frequent that the employee cannot effectively use that time for personal purposes. When determining whether an employee can use on-call time for personal purposes, courts look at whether there are excessive geographical limitations on an employee’s movements, whether the frequency of calls received or a fixed time limit for response is unduly restrictive, whether the employee could easily trade on-call responsibilities, whether use of a pager could ease restrictions, and whether the on-call policy is based on an agreement between the parties. Non-exempt salaried employees are the ones most likely to work off the clock and not be paid. Non-exempt salaried employees are often tempted to work off the clock voluntarily to impress their supervisors and avoid costing them overtime. Even if it is voluntary and the employee was not forced to work off the clock, it would still nonetheless be illegal for the employee to work off the clock and not be paid for the extra hours worked. Working through unpaid lunch break. Yes, all non-exempt employees must receive overtime pay for hours worked over forty (40) in a workweek at a rate not less than time and one-half their regular rates of pay. The duties of the position satisfy either the executive duties test, the administrative duties test, or the professional duties test. Just because you are paid a salary of at least $455 per week does not mean that you are automatically exempt from overtime pay. You must also satisfy the duties test to be exempt. The overtime requirement is based on total number of hours worked in a given workweek. Employers must calculate the workweek as a fixed schedule of a continuous, seven-day, 24-hours per day schedule. It does not have to be Sunday to Saturday. It can start on any day of the week and end seven (7) consecutive days later. Any hours worked beyond forty (40) in this workweek are subject to overtime pay. 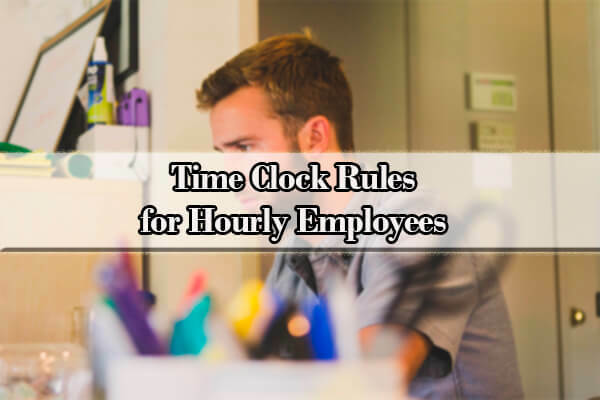 While there are no time clock laws that mandate that all employees clock in and clock out, employers are required to keep accurate records of all non-exempt employees’ hours worked. However, the Department of Labor does not require any specific system for collecting this information, stating that “any timekeeping plan is acceptable as long as it is complete and accurate.” For example, time records can be generated by a punch clock, biometric clocking, proximity clocking, SMS clocking, mobile phone clocking, or even clocking in via a PC. The important thing is that time be kept contemporaneously with the work being performed, to ensure the accuracy and integrity of the records. There is no requirement that automated time clocks be used, and in fact, having employees record their time by hand is perfectly acceptable. The FLSA also permits employers to round non-exempt employees’ time to the nearest quarter-hour. If employers wish to round to a smaller increment, they can do so as long as the time clock rounding is designed to “average out” over time. In other words, an employer cannot always round down. The employer should choose the midpoint of the rounding window and adopt a consistent practice of rounding down where the time recorded is below the midpoint and rounding up where the time is above it. Pursuant to the 7-minute rule, if the employer adopts a 15-minute window, minutes 1-7 can be rounded down but minutes 8-15 must be rounded up. Q: Is working off the clock illegal? A: Whether or not the employer is overlooking or encouraging off-the-clock work, it is nonetheless illegal. Employees can file a complaint with the Department of Labor or file a lawsuit for unpaid wages under the FLSA. Q: What is the 7-minute rule for time keeping? A: When an employer tracks work time in 15-minute increments, the cutoff point for rounding down is 7 full minutes. If the employee works at least 8 full minutes, the employer must round up. Q: Can my employer refuse to pay me if I forget to clock in? A: The FLSA states that employees must receive pay for all time worked. This means that it is illegal to dock an employee’s wage for clocking-in late if they actually worked during the time the system missed. Q: How does the 7-minute rule work? A: Under the 7-minute rule, clock-in and clock-out times on timecards are rounded to the nearest quarter hour. It is called the 7-minute rule because the cutoff is 7 minutes after the clock-in time. Many time clocks and computerized payroll programs automatically round an employee’s hours using the 7-minute rule. Q: Is it legal for an employer to adjust your hours? A: Believe it or not, it’s actually perfectly legal for an employer to modify a time card without an employee’s knowledge, as long as the employee is paid for all time worked. Q: Can an employer make you wait to clock in? A: Many employers make their employees wait to clock in until their assigned shifts begin. 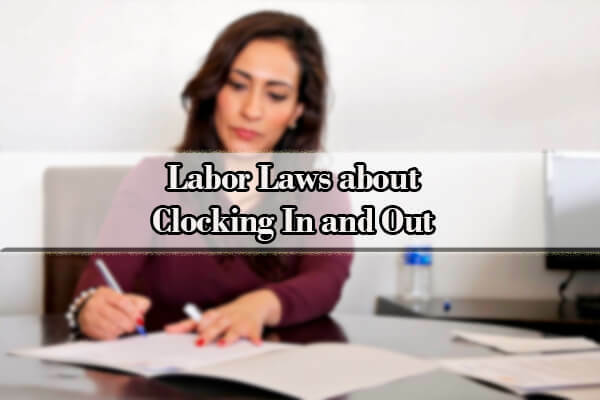 However, this means that the employer cannot require the employee to perform any work prior to clocking in or the employee will have to be paid for that time. Q: Can your boss ask you to work off the clock? A: Your employer cannot ask, require, or even allow you to work off the clock. If you’re a non-exempt employee, you must be paid for all time worked. You can’t waive this right. Q: Can I sue for working off the clock? A: If you were not paid for all hours worked, you can bring a lawsuit for unpaid wages under the FLSA. Q: Can you get fired for refusing to work overtime? A: Yes. The employer gets to decide the number of hours each week that you work, even if it means working more than 40 hours per week. If an employee refuses to work the hours that the employer requires, the employer has the right to fire that employee. The only caveat is that for all hours worked over forty (40) in a workweek, the employer must compensate the non-exempt employee at a rate not less than time and one-half the employee’s regular rate of pay. 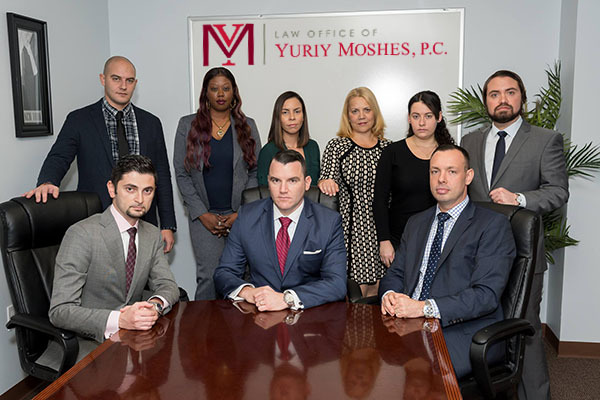 The Law Office of Yuriy Moshes has experienced employment lawyers who are knowledgeable in resolving employment disputes and protecting employee rights. We help workers in the New York City area including all its boroughs (Manhattan, Brooklyn, Queens, the Bronx and Staten Island) as well as Northern New Jersey, Long Island, and Upstate New York.